With the National Defense Forces claiming victory in a message posted to Facebook, we look at how much of its home turf the Syrian Army has managed to reclaim since the rebel offensive began Mar. 21. The Syrian army says it has retaken the area around Observatory 45, a key strategic hilltop base in Latakia, after rebel forces carried out a surprise offensive on troops there on March 21. “Syrian army units have full control of Observatory 45 in the north of Latakia province and are continuing to pursue terrorist groups,” Syrian state television said Monday, quoting military sources. Yesterday, the National Defense Forces, an Alawite militia group fighting with the Syrian army, posted a Facebook message saying it had regained total control of the area. Last week rebel forces, including fighters with al-Qaida affiliate Jabhat al-Nusra, captured the coastal Christian-Armenian town of Kessab and a nearby border crossing with Turkey, their first foothold along the Mediterranean coast. The Syrian army says it has retaken the area around Observatory 45, a strategic base in Latakia. We asked Aymenn al-Tamimi, Shillman-Ginsburg Fellow at the Middle East Forum, to weigh in on the current situation on the ground in Latakia. SD: How did the government regain some ground so quickly? Aymenn al-Tamimi: They basically did a sweeping operation. They did an aerial bombardment, and then also in the end, in this area, the government does have an advantage over the rebels. Latakia is government territory. This is why I said at the beginning, about the initial gains, that that doesn’t really matter. It’s risky to take those initial gains [as a win] because it’s likely they’ll eventually be repelled. Last year when they staged an offensive, that also made initial gains. They say they took the area around Tower 45. The other day, [rebel fighting group] Harakat Sham al-Islam put out photos showing they were still in the area and in control of it, and they said, we’re going to keep advancing against the Alawites, against the enemies of religion, on that video as well. 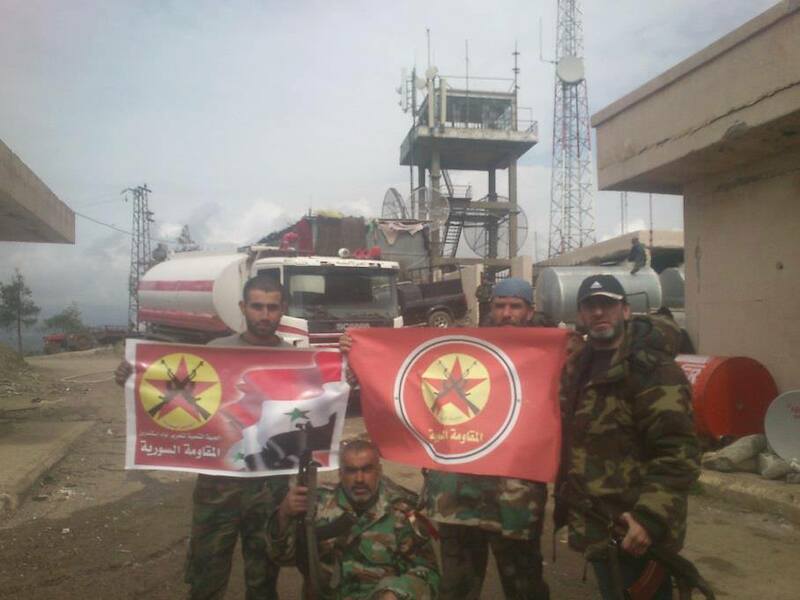 Members of the Muqawama Souriya at Observatory 45, before it fell into rebel hands. The area was subsequently recaptured in a joint operation between the Syrian Army and the Muqawama Souriya, a shabiha group. / Courtesy Muqawama Souriya. A sign of the rebels having lost ground around Observatory 45 is the fact that Harakat Sham al-Islam’s leader – ex-Gitmo detainee Ibrahim bin Shakaran – has been killed. Now accusations of treachery are coming up, claims that other rebels supposedly abandoned Harakat Sham al-Islam to fend off the Syrian army. SD: Does this erase the rebels’ symbolic victory of last week? Tamimi: I don’t think the rebels mind, necessarily, because they have managed to kill some prominent Assad figures, like Hilal al-Assad, who was the leader of the National Defense Forces in Latakia. I don’t think the rebels were expecting it – they could say they were hoping to advance and take Latakia City and so on – but at a minimum they were hoping to kill off some prominent government figures and they did achieve that goal. There’s a tendency too often to extrapolate too much from the initial gains that the rebels make. I never expected them to hold, and don’t expect them to hold much of this new territory they’ve gained in Latakia in the long run. There’s a tendency too often to extrapolate too much from the initial gains that the rebels make, whenever they do this kind of thing in Latakia. SD: What’s the most powerful rebel group right now in Latakia? Tamimi: The least influential is the FSA brand. They’ve kind of tagged along later on, and the opposition might make a symbolic visit to the rebel-held areas, in the same way that Salim Idris made a visit to Jebel Akrad during the last offensive back in the summer. You should never take too much from it and assume that means the Free Syrian Army is leading the offensive. I’d say that the Islamic Front and Harakat seem to be the most important groupings. Perhaps Jabhat al-Nusra is a third. This is very difficult to measure out. A lot of the heavy weaponry used in the offensive came from groups under the Islamic Front umbrella, like Sahrar al-Sham. But I’d still say that the offensive has been mujahereen-led, with certain groups and their Chechnyan foreign-fighter components and Hadikat, which is Moroccan-led. I’d still say that the offensive has been mujahereen-led. SD: How big has the foreign fighter presence been in this offensive? Tamimi: [Chechens are] definitely leading the Kataib and Sahrar al-Sham components, and Harakat al-Sham was of course founded by Moroccans, and they’re good fighters. Syrians and many of the mujahereen are very much secondary figures within Harakat al-Sham. The government, meanwhile, doesn’t have any foreign fighters’ help that I know of.